Although personal attributes have gained recognition as an important area of effective corporate governance, scholarship has largely overlooked the value and implications of individual virtue in governance practice. We explore how authenticity—a personal and morally significant virtue—affects the primary monitoring and strategy functions of the board of directors as well as core processes concerning director selection, cultivation, and enactment by the board. 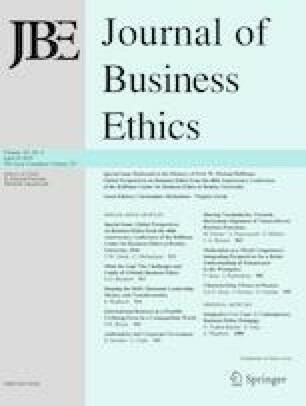 While the predominant focus in corporate governance research has been on structural factors that influence firm financial outcomes, this paper shifts attention to the role of authenticity and its relationship to individual board member qualities and collective board activities. We explore how authenticity has the potential to influence board dynamics and decision making and to enhance transparency and accountability. This article does not contain any studies with human participants or animals performed by either of the authors. Clapp-Smith, R., Vogelgesang, G., & Avey, J. B. (2009). Authentic leadership and positive psychological capital: The mediating role of trust at the group level of analysis. Management Department Faculty Publications, 23, 227–240. http://digitalcommons.unl.edu/managementfacpub/23. Edelman (2017). 2017 Edelman trust barometer annual global report. Retrieved November 6, 2017, from https://www.edelman.com/global-results/. PwC (2017). Annual Corporate Directors Survey. Retrieved from https://www.pwc.com/us/en/governance-insights-center/annual-corporate-directors-survey/assets/pwc-2017-annual-corporate--directors--survey.pdf. Spencer Stuart (2016). Spencer Stuart Board Index 2016. Retrieved from https://www.spencerstuart.com/~/media/pdf%20files/research%20and%20insight%20pdfs/spencer-stuart-us-board-index-2016_july2017.pdf?la=en.